A big blade that delivers brute chopping and slashing power, this heavy duty machete is ideal for stabbing, slicing, and decapitating Zombies. Full tang and built to withstand wear and tear, the machete is constructed from a solid slab of heavy duty stainless steel with a black anodize finish. The spine features a wave design to compliment the fierce style of this piece and weight reducing cutouts help to deliver graceful yet forceful swings that cut clean on impact. 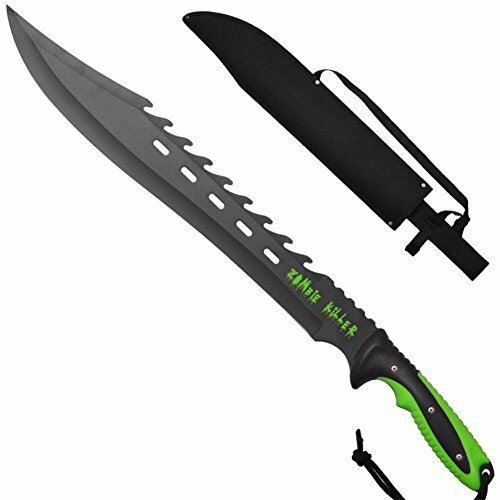 The ergonomic textured black and green ABS grip helps to maximize comfort while minimizing slippage and to match the handle Zombie Killer is silk-screened on the blade so you know exactly what this machete was made for. The machete comes with a FREE nylon Velcro fastened sheath that is reinforced to prevent damage while sheathed and a lanyard hole. If you have any questions about this product by Armory Replicas, contact us by completing and submitting the form below. If you are looking for a specif part number, please include it with your message. Ontario Knife Company 8519 Heavy Duty Knife with"D" Black Handle - Retail Package, 22"